Le Laboratoire des Sciences Sociales du Politique - Article "1866 : why the Russian bomb did not explode"
Article "1866 : why the Russian bomb did not explode"
par Stéphanie Burgaud pour l’International History Review. 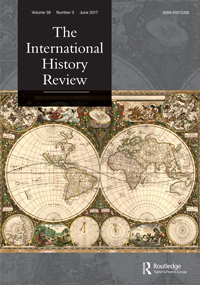 Parution de l’article de Stéphanie Burgaud "1866 : why the Russian bomb did not explode" dans la revue The International History Review, 2018, 40:2, p. 253-272. The fall of the Berlin Wall has provided access to archives in Central and Eastern Europe and especially in Russia ; new theses may be written as long as they remain open and they often show that our conceptions of international relations during the nineteenth century are outdated and mistaken. This contribution takes as a starting point the events of 1866 that we can consider to be a major turning point in nineteenth century Europe : the end of a relative and concerted balance of powers in central Europe, the first step towards the creation of a unitary German State. The article uses them here to question Russian foreign policy during a transitional decade of its history, through an analysis of the figure and missions of Minister Aleksandr Gorchakov. In order to do this, the article relies on completely new and varied material in four languages : diplomatic archives, personal archives, and a meticulous study of the press. The conclusions reached have been hitherto unseen and they put i nto question what was thought to be known regarding Russia’s political line after the Crimean War. Now it is no longer possible to consider that Russian policy in Europe has been passive, conservative, and pro-German. Stéphanie Burgaud is a former student of the Rue d’Ulm with a PhD degree from the University of Paris-Sorbonne. She is a senior lecturer in modern history at the IEP of Toulouse. Her research explores international relations during the nineteenth century. She has published La politique russe de Bismarck et l’unification allemande. Mythe fondateur et réalités politiques (Strasbourg : PUS, 2010), and more recently L’Europe dans la construction politique et identitaire russe. Du XIXe siècle à nos jours, with Delphine Placidi-Frot (Paris : Éditions Rue d’Ulm, 2013). est Maître de Conférences d’Histoire, Ancienne Elève de l’Ecole Normale Supérieure, Directrice des Masters Gouvernance des Relations Internationales à Sciences-Po Toulouse, membre du Laboratoire des Sciences Sociales du Politique.